Is Google becoming too bloated? In recent years, the company has grown from being simply a search engine company to having a hand in a range of sectors including mobile, social media, cloud computing, digital music sales and more. Like Jobs, some analysts are beginning to speculate that Google’s expansion will make it more difficult for innovative ideas to come to the surface. How can Google avoid some of the missteps made by Microsoft during its rapid expansion? And what can the search company learn from Microsoft — which, after all, continues to be a profitable company despite charges that its size has made it less nimble in reacting to market changes and introducing game-changing products. 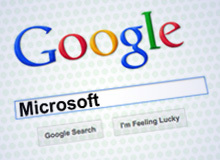 Comparisons between Google and Microsoft began to surface soon after the search engine company went public in 2004. Both firms started out dominating in one area — for Google, it was search; for Microsoft, it was the Windows operating system. By leveraging those core strengths, the companies were able to move into new markets. Google expanded into display advertising and later the mobile phone space with its Android operating system. Microsoft expanded into other software products, such as its Office word processing suite, and into the entertainment sector with its Xbox video game system. Since that letter, however, Google, like Microsoft before it, has drawn the scrutiny of antitrust regulators from the United States and Europe regarding Google’s business practices and whether its dominance in the search market can be considered a monopoly. Microsoft dealt with a comparable situation in the late 1990s, when the company was sued by the U.S. Department of Justice and 20 states that alleged Microsoft abused its dominant market position in the way it sold operating systems and web browsers. According to November figures from research firm comScore, however, Google controlled a commanding 67.6% of the search engine market, compared with a 26.7% share for Bing. “Google resembles Microsoft more than Google thinks it does,” Matwyshyn points out. Indeed, Google has demonstrated a willingness to keep experimenting with services until it finds a version that catches on with consumers. The company’s social media efforts, for example, have cycled through the unsuccessful Google Buzz and Google Wave. Now, the search giant is trying to build Google+ into a viable competitor to Facebook. Every year, co-founders Page and Brin write a letter to shareholders. In the 2010 edition, they noted that Google has been “prepared, from the get-go, to place big bets on new technologies — with the full knowledge that not all of these will always pay off.” Indeed, Page scuttled a series of projects in the last year, including the personal health record service Google Health and a plan to digitize the world’s newspapers archives and make them available online. Matwyshyn points to Microsoft as an example of why Google might have trouble staying nimble as it grows. “Microsoft has a lot of good ideas internally, but they don’t always bubble up to the production line,” says Matwyshyn, adding that “Microsoft also has bad timing.” Although the software firm was initially ahead at developing touch screen technology, she notes, it took Apple’s iPhone to make the feature popular. Microsoft also entered the tablet market before consumers were ready, only to watch Apple dominate the market.